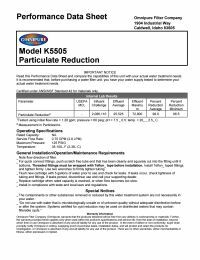 The Omnipure K-Series K5505-BB is a 5µm sediment filter and is best used as a system component. The K-Series from Omnipure is completely adaptable to various lengths and diameters to meet specific filtration needs. The versatility of the K5505-BB can be used in ice makers, refrigerators, beverage equipment and drinking fountains. Reverse Osmosis systems can work together with purification systems to provide the purest water possible.